Juanita la Lagrimosa is a popular strain that originates from Europe, where it has earned prestige as a rare variety of cannabis. The strain is well-known for its balanced cannabinoid ratio of 1:1 between psychoactive THC and highly medicinal CBD. This profile makes Juanita la Lagrimosa an excellent strain for medical patients seeking a potent healing strain that doesn’t offer an overwhelming psychoactive high. Laboratory testing has shown that Juanita la Lagrimosa contains around 8.81% CBD and approximately 6.77% THC. Juanita la Lagrimosa is the result of crossbreeding various Thai and Mexican landraces, with the strain’s original ancestors being a mix of a Mexican/Afghan male and a Reina Madre mother plant. The strain is sativa-dominant, resulting in a head high that offers smokers a clean and energising buzz. This enjoyable and functional high is augmented by the sensual characteristics of the plant. The flowers of Juanita la Lagrimosa offer a potent, fruity taste along with aromas of lemon Haze. The strain can be grown in many environments, with indoor plants boasting a short flowering window of 60-65 days. 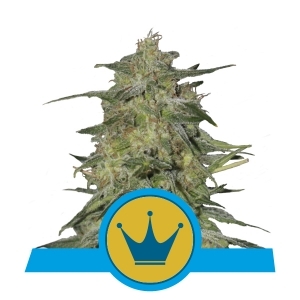 Royal Queen Seeds has successfully experimented with Juanita la Lagrimosa genetics and has proudly produced a pantheon of remarkable strains in doing so. Here they are below. Fast Eddy consists of 50% sativa genetics, 40% indica genetics, and 10% ruderalis genetics. Crossbreeding Juanita la Lagrimosa, Cheese, and Cannabis ruderalis results in this impressive strain. Fast Eddy is a great example of the continuation of Juanita la Lagrimosa, and possesses some of the features that makes its parent strain so special. Fast Eddy contains only 9% THC alongside high levels of CBD. This cannabinoid profile makes Fast Eddy very appealing to medical users who wish to utilise both cannabinoids, yet don’t want a strain so high in THC that it disrupts their ability to function. The strain also makes a great choice for recreational users who prefer to smoke less potent cannabis; it’s the type of high that allows for full-functionality whilst still generating a pleasant psychoactive buzz. 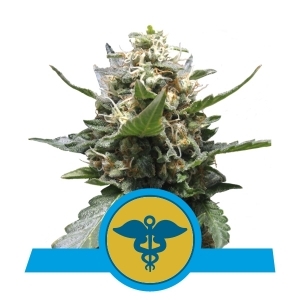 The strain offers a clear-headed high that is recognised for its pain-relieving abilities. Fast Eddy grows well in both indoor and outdoor settings. When grown indoors within grow rooms or tents, the strain can achieve heights of 60-100cm, providing yields of approximately 400-450g/m². The small stature of this strain means it’s easy to keep the grow-op on the down-low, and many plants can be cultivated in limited space. Outdoor plants achieve slightly taller heights of around 80-120cm and yields of 80-130g/plant. With a flowering period of 6-7 weeks, the plants will be ready to harvest around 8-9 weeks after sprouting has taken place. Fast Eddy has a preference for mild climates. Stress Killer consists of 60% sativa genetics, 30% indica genetics, and 10% ruderalis genetics. The strain is derived from crossbreeding Juanita la Lagrimosa, Lemon Shining Silver Haze, and Cannabis ruderalis. Stress Killer was intentionally bred to offer a clear and functional high - one that helps it achieve its namesake. The strain contains a THC content of 11% and high levels of CBD. This cannabinoid profile allows for a slightly more intense high, without rendering the smoker incapable of carrying out everyday tasks. Again, this Juanita la Lagrimosa descendant offers medical users an excellent option, with only a slight psychoactive kick. The high induced by Stress Killer is known to help enhance mental focus - so smokers will have no problem working or engaging in creative activities. Stress Killer grows well both indoors and outdoors. Indoor plants reach heights of between 90-140cm and pump out impressive yields of between 450-500g/m². On the other hand, outdoor plants can grow up to between 120-160cm in height and output yields of 110-160g/plant. The flowering period of Stress Killer lasts around 7 weeks and the strain is ready for harvest within only 11 weeks post-germination. This strain is easy to grow and prefers a mild climate. 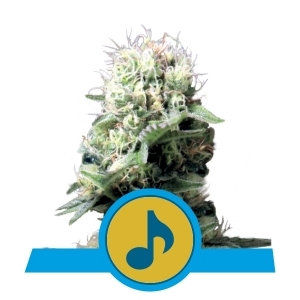 Dance World is a sativa-dominant strain that consists of 75% sativa genetics and 25% indica genetics. The strain is the lovechild of parents Dancehall 20 and Juanita la Lagrimosa. This crossbreeding project has resulted in a strain that offers a THC content of 12%, augmented by a high CBD content. Smoking the flowers of Dance World induces a motivating and inspiring high that is very much on the sativa side of the spectrum. On the recreational side of things, this high helps smokers get into the zone and achieve their daily goals. From a medical perspective, the high CBD content, along with a light psychoactive high, is perfect for dosing CBD throughout the day without becoming nonfunctional or exhausted. Dance World can be grown successfully in both indoor and outdoor settings, though the strain has a preference for a cold environment. When growing Dance World indoors within a grow room, expect to see plants reach heights of up to 100cm and provide yields of up to 525g/m². This small size and large harvest means this strain is excellent at making good use of its space. Outdoor plants can grow up to 120cm and will achieve yields of up to 450g/plant. This relatively small size makes Dance World a great strain for avoiding unwanted attention. The strain has a flowering period of 8 weeks and will be ready to harvest during early October if cultivated outside. Royal Highness is on the higher-end of the THC spectrum when it comes to some of the descendants of Juanita la Lagrimosa. The strain features a THC content of 14%, with a high CBD content. The higher THC levels can be appealing to both recreational and medical users. In recreational terms, the strain offers a slightly more potent high that is at the same time coupled with a clear and cerebral effect, excellent for working on creative projects and delving into philosophical discussions with friends. This THC content also makes the strain an optimal choice for medical users seeking decent amounts of both THC and CBD for their health regimen. The high induced by Royal Highness is characterised by a clear and lucid state, without the euphoria and overwhelm associated with higher THC strains. When enjoying this strain, smokers will be greeted by tastes of sweetness along with aromatic scents of fruit and Skunk. Royal Highness is a sativa-dominant strain that features 60% sativa genetics and 40% indica genetics. The strain results from crossbreeding Respect 13 and Dancehall 24. Royal Highness tolerates both indoor and outdoor growth well. Indoor plants will reach heights between 60-100cm and will offer yields of up to an impressive 600g/m². Alternatively, outdoor plants will reach slightly taller heights of between 80-110cm and can produce yields of up to 475g/plant. The flowering time of Royal Highness is 9 weeks, and outdoor plants will be ready for harvest during early October. The strain takes well to a warm climate. 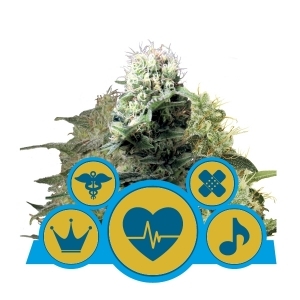 Royal Medic is a sativa-dominant strain that consists of 75% sativa genetics and only 25% indica genetics. This genetic makeup gives Royal Medic much more of an energising, focussed, and cerebral effect when smoked, as opposed to a body high, which is still present, yet not dominant. The strain was created via the crossbreeding of Juanita la Lagrimosa and Critical. The high CBD content of this strain is accompanied by a low THC content of 10%. When smoking blunts or joints loaded with the processed flowers of Royal Medic, smokers will experience a tasty mix of spiciness and sweetness. Royal Medic grows vigorously both indoors and out, and actually deals well with a cold climate. Indoor plants cultivated within grow rooms will achieve heights up to 120cm and produce yields up to 475g/m². Outdoor plants grown within garden beds or pots will grow up to 150cm in height and will offer impressive harvests of up to 525g/plant. The flowering time of Royal Medic is 9 weeks and the harvest period for outdoor plants is early October. 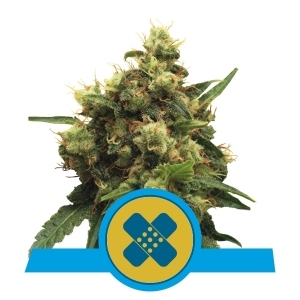 Painkiller XL is a sativa-dominant strain that is comprised of 75% sativa genetics and 25% indica genetics. This strain comes from parents Royal Highness and Juanita la Lagrimosa. Painkiller is an excellent medical strain that is very high in CBD and only features a THC content of 9%. This strain offers medical users the amazing health benefits of CBD, with little exposure to psychoactive THC. This allows one to experience the anti-inflammatory, anti-seizure, and other healing properties of CBD without becoming too stoned in the process. The slight high associated with smoking this strain is quite physical and very clear. Painkiller XL likes a mild climate and can be grown indoors and outdoors, producing large yields regardless. Indoor plants will produce impressive harvests of up to 550g/m² and grow up to 100cm in height. Outdoor plants will reach the heights of 150cm and output massive yields of up to 550g/plant. The flowering time of Painkiller XL is only 8 weeks and harvest time for outdoor plants occurs during late September.